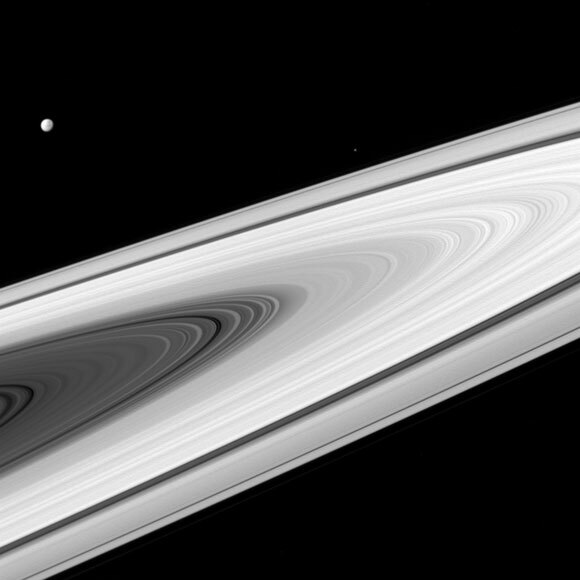 This newly released Cassini image shows Saturn’s rings with Dione and Epimetheus off in the distance. Saturn’s main rings, along with its and moons, are much brighter than most stars. As a result, much shorter exposure times (10 milliseconds, in this case) are required to produce an image and not saturate the detectors of the imaging cameras on NASA’s Cassini spacecraft. A longer exposure would be required to capture the stars as well. Cassini has captured stars on many occasions, especially when a target moon is in eclipse, and thus darker than normal. Be the first to comment on "Cassini Image Shows Saturn’s Rings with Dione and Epimetheus"